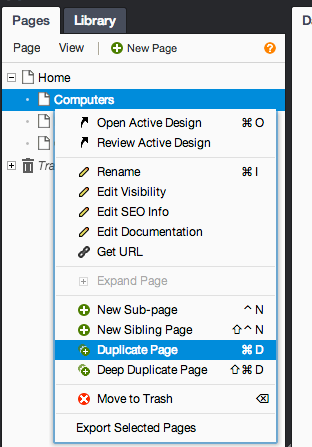 One way to quickly build your website architecture is to duplicate a page. A duplicated page includes all designs, documentation, and SEO content. Review topics and comments are not included. You can duplicate any page except the root page. 2. Select the page to be duplicated. Duplicate the page by selecting Duplicate Page from the File menu or from the right-click context menu, or by using the keyboard shortcut. To duplicate the selected page and its subpages, select Deep Duplicate Page. 4. Edit the page properties. Edit the page properties from the right-click context menu, or by using the keyboard shortcut. As shown below, you can duplicate a page using the right-click context menu.